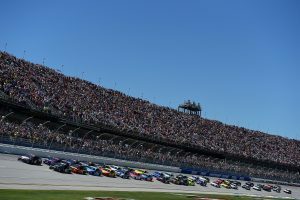 Talladega Superspeedway – which celebrates its 50th anniversary in 2019 – is the biggest, most competitive, and fan-friendly race track in NASCAR which kicks off its season with a tripleheader April 26-28 with the running of the GEICO 500, the MoneyLion 300 and the General Tire 200. The winner of the GEICO 500 will not only punch his ticket into NASCAR’s Playoffs, but will take home the coveted Vulcan Trophy, symbolic of the grand statue that overlooks Birmingham. Talladega Superspeedway offers something for everyone, including hundreds of acres of free camping, amazing kids tickets and college student prices, along with special offers for military members, first responders, teachers and educators. With a new oversized vehicle tunnel, fans now have 24-hour access into the iconic infield. It’s the first part of the Transformation infield project which will allow fans to be immersed into the sport like never before. To learn about how to be a part of the family fun this spring, as well as the Transformation project that will culminate in October.